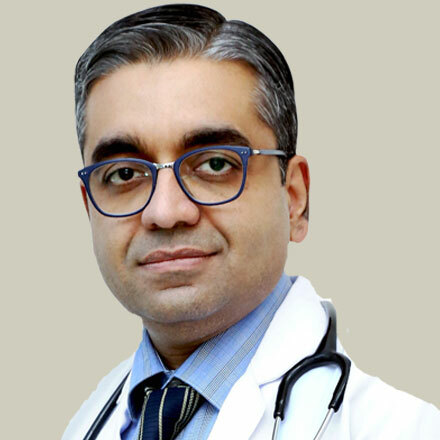 Dr Reetesh Sharma, Director and Head Nephrology and Kidney Transplant Medicine, has received training in Internal Medicine at one of the leading institutes of the country (KEM Hospital, Mumbai) and in Nephrology at the Apollo Hospitals. In addition, he underwent advanced training in transplant at the Maastricht Hospital, Netherlands and in ABO incompatible transplant at the Tokyo University Hospital, Japan. Prior to this he was associated with Medanta-the Medicity since its inception in 2009. He also established the dialysis services at the Fortis Escorts Hospital, New Delhi in 2008. With more than a decade of experience, he has been involved in more than 2,000 transplants across Medanta, Fortis and Apollo hospitals. Dr Reetesh believes in practicing the science of medicine like an art, with a human touch. Achievements: Advanced Training in Transplant – Maastricht Hospital, Netherlands – Sep 2012; Preceptorship Training in ABO- incompatible Transplant, Tokyo University Hospital Japan – Nov 2017; Jayakar’s Post Graduate Award in Clinical Medicine for the year 2002-2003, for standing first in inter-collegiate competitive examination; Best paper presentation: Post-partum acute renal failure – at Renal Sciences Update, Delhi Nephrology Society 2005; Best paper presentation: Steroid free transplantation- ISNCON 2010; Best paper presentation: Acute Kidney Injury in cardiac surgeries- ISNCON 2012. His work is widely published across the country. Memberships: Delhi Nephrology Society; Indian Society of Nephrology; Indian Society of Organ Transplant; International Society of Nephrology (ISN); ERA – EDTA.